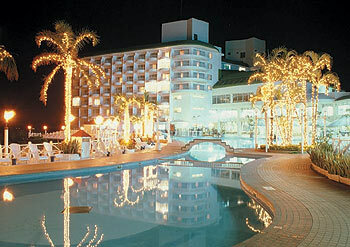 Resorts in Okinawa during the off-season are not teeming with visitors as they are in the summer months. This is a good thing for local residents, however, since hotel facilities are made available to locals under limited special plans at unbelievably low prices. The Kariyushi Beach Resort Onna is a luxurious resort hotel located at the top of a hill with a spectacular ocean view. Unlike many other island resorts, this one caters to families, providing activities to keep children entertained while offering plenty of places for adults to relax as well. 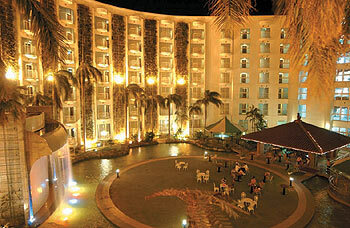 The resort is promoting a reasonably priced plan from Dec. 1 to Jan. 31, 2003 (excluding Dec. 31-Jan. 4). A huge bathhouse, an open-air bath, a sauna, an indoor swimming pool, a gymnasium and field sports facilities are open to all hotel guests at 50 percent off the normal price. If you tell them that you saw this article in Island Market when making a reservation, you are entitled to one night in a double room for ¥7,000 per adult (¥7,000 per child), in a triple for ¥6,000 per adult (¥4,500 per child) or in a quadruple for ¥5,000 per adult (¥4,500 per child). Children from 7 to 12 years of age are eligible for the children’s rate; those six and under are free. The above prices include a service charge, but tax is not included. An additional ¥500 per person will be charged on Fridays, Saturdays and the day before holidays. A one-night stay comes with breakfast. To get to the Kariyushi Beach Resort Onna, head towards Nago on Highway 58. After passing Inbu Beach on your left, you will see a Lawson convenience store on your right. Drive approximately a half-mile further, and the hotel will be located at the top of the hill. The entrance is on your right. Enjoy this limited special plan that can’t be experienced anywhere other than at the Kariyushi Beach Resort Onna.